Armagh were successful that night but a defeat at Old Belvedere last weekend saw them drop to seventh in the league but with it being so tight assistant coach Chris Parker knows a win will put the Orchard County side back in play-off contention. “We’re in a position now where we need to get points again after not getting anything last weekend, so we’ll be going out to try and get the victory,” said Parker. “I think we’re two points off ninth and two points off third. “ It really can go either way and it is important that you keep picking up your points, especially at home and we’ll be looking to make sure we can try and do that again. We want to try and keep within touching distance of the play-offs. 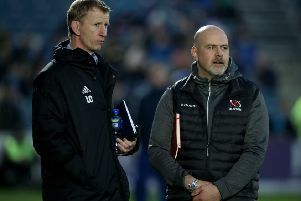 “I thought the Senior Cup final was always going to be a one score game either way and I’d say Saturday will be the same. “Despite what has happened in the last two games they have an excellent defence who are very well organised and we’ll be taking nothing for granted. “Everyone knows in Ulster derbies the form book goes out the window and anything can happen. Armagh’s forwards are boosted by the return of Oisin Kiernan, Eoin O’Hagan, Andrew Smyth and Philip Fletcher. Ballymena have shipped over 100 points in their last two defeats and are 10 points adrift at the bottom of the table but coach Andy Graham is hoping for a fighting performance. “Ten points is a big ask and you are starting to run out of games you have to get points and that is the simple fact,” said Graham. “We were well beat last weekend and it was disappointing but that is where we are at the minute. “ It’s difficult but we have to pick ourselves up and that is the problem. “Two defeats and the heads drop but you have to have that will to keep fighting and keep trying and see what we can get. “We went there in the Ulster League and won so we know we can beat them. “It is just getting it right, when ever you have suffered a couple of heavy loses you become that bit more fragile mentality. “ And it is really having that mental toughness to see it through and still operate and have the belief that you can go and win the game and that is the biggest thing to install in the players.